See below for info on the Crash Course in Jewish History book – fully sourced and annotated with timelines, maps, charts and bibliography. If you enjoyed the course online, you’ll love the book! 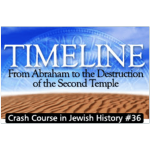 From Abraham and the birth of monotheism to the Holocaust and the creation of modern Israel-Crash Course in Jewish History explores 3,800 years of Jewish existence. Ken Spiro takes the reader on a fascinating and informative journey through time, highlighting the key lessons of Jewish and world history and the profound relevance that the past holds for the future of both the Jewish people and humanity.